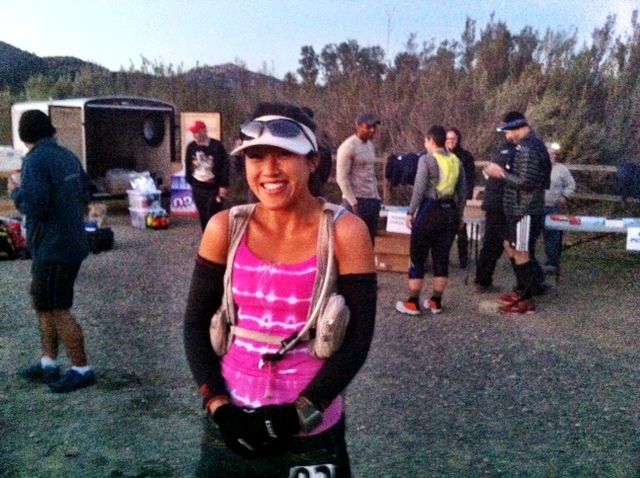 This past weekend was the inaugural San Diego 50 Miler at San Dieguito River Park (Escondido). When people ask me what my “A” race is this year, this was one of them. An “A” race doesn’t have to be a 100 miler, it could be any distance or event you want to excel in. To me, an “A” race is something you have trained hard for and can really give it your all to perform your best. I realized a lot of my races last year were all training runs for something bigger, mainly Zion 100. I never felt the urge to ‘race’ anything because I never went into any race completely rested. Run 10 miles before a 50 the next day? Sure. Run back to back 50Ks? No problem. Getting the miles in and learning how to run on tired legs was more important than finishing at the top. I embraced endurance and shunned speed, not realizing I could be good at both. Since I had my eyes set on San Diego, I ramped up my mileage, diligently cross and strength trained and tapered/rested the week before and felt as healthy as I could be going into the race. The race started at San Pasqual Valley Trailhead, after a quick race briefing on how not to get lost (do not cross over the triple white lines!) we headed out on the Valley Trail. 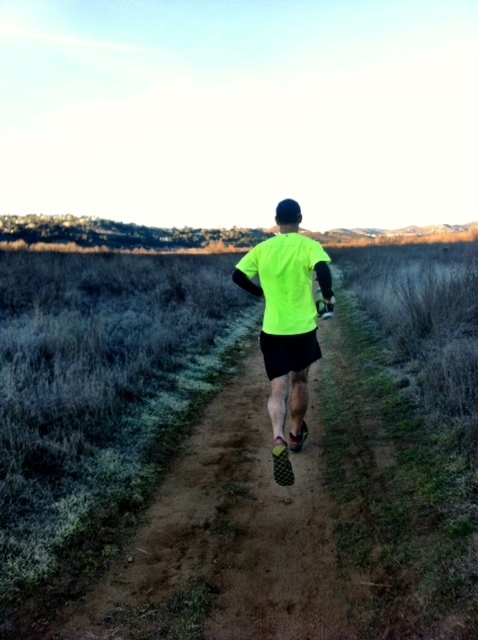 The beginning miles were really runnable with soft dirt trails winding along farms. 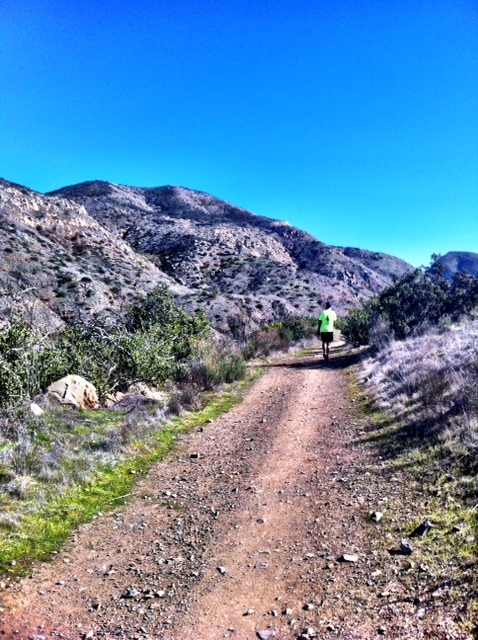 The smooth terrain gave us a chance to warm up in the cool weather. I ran with Keira and Matt for the first couple of miles, easily averaging 8:30 miles and feeling great. The good thing about this course is that it is an out and back so we knew what to expect the 2nd half of the race. We ran up and over Raptor Ridge which was a fun downhill and one of the steeper hills we would have to climb throughout the course. It was hard to hold myself back and run slower when everything felt right. 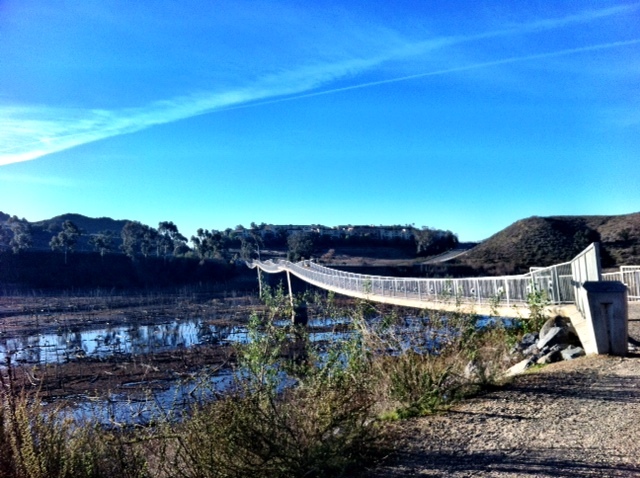 Miles 10-20 was mostly along a single track trail overlooking Lake Hodges. There were a couple tricky rocky sections with rollers thrown in, but I was feeling really good churning out the miles watching my mile splits get faster and faster. The trail also gave way to more shade since it was covered by trees. I overheard a couple aid station volunteers tell me I was first woman and 5th overall. Trying not to get too ahead of myself since we weren’t even halfway through the course yet, I kept my head low and really focused on my nutrition and getting from one aid to the next. Matt and I had separated somewhere during this section, which later I found out he had taken a bad spill. 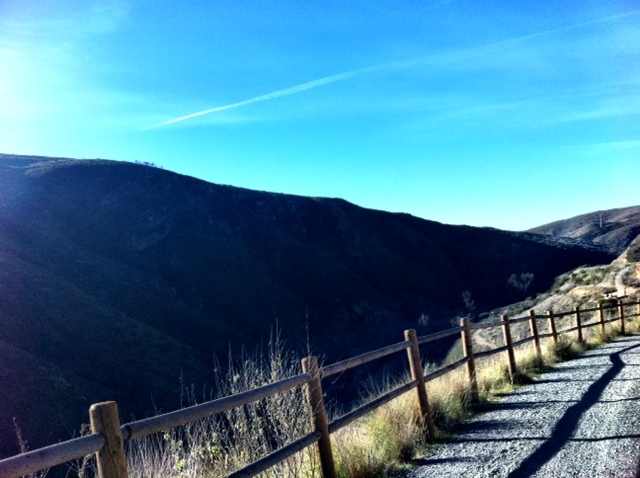 We connected to the Del Dios Gorge Trail which was fun running down though it ended with a series of switchbacks coming back up where I alternated between my lame ‘power hiking’ and running. Miles 20-25 were harder for me. The heat was starting to set in, the climbs were getting steeper and I was cursing myself for going out too fast. What was I thinking? Leading the woman’s race so early on is never a good idea. Luckily Matt caught up during this section as we made our way towards the turnaround. At some point we had to cross over a fairly deep pool of water. I didn’t even bother looking for another way around to avoid getting wet and ran right through with the water coming up to my thighs. It felt so refreshing and totally worth the sloshy shoes for a couple miles after. The aid station was at Mile 25 but we still had to go out a half mile before coming back to the same aid. I started chugging ice cold water, soda, electrolytes, any liquid calories I could get my hands on. I stopped eating GU’s and couldn’t stomach anything solid. After the short out and back, I saw the 2nd and 3rd place women coming into the aid station as we were pulling out. Though I still had the lead, the fast miles were starting to take a toll. My energy was low, my legs felt like bricks and I was very dehydrated. I ran what I could and every time Matt stopped to walk in front of me, I walked too. Everyone coming in the other direction was encouraging me to keep it up which made me stress out that I couldn’t hold onto this lead much longer. I tried hard to look as happy as I could to everyone passing by even though I was feeling the exact opposite. Whenever I think of the front runners, they always make it look so effortless like it’s no big deal. Well, I’m no front runner and it was a big deal. As we were climbing back up the switchbacks I looked across the trail and could see the 2nd place female bombing down the trail. I expressed my worry that she was going to catch me soon but Matt told me not to worry and it would be okay if she did. It was a real struggle getting to the the Mile 29 aid. I told myself to take a few minutes here to recharge and cool down. I could feel myself unraveling with 21 miles to go so I slammed down cup after cup of soda and ice water apologizing to the volunteers at how many cups I was wasting but they encouraged me to keep drinking. It was also nice to see my friend Gabe manning the aid station! Sure enough, the 2nd woman blew by the aid asking how many miles to go until the next aid. I tried not to let it discourage me watching her take off since I would much rather spend a few minutes at each aid recharging. 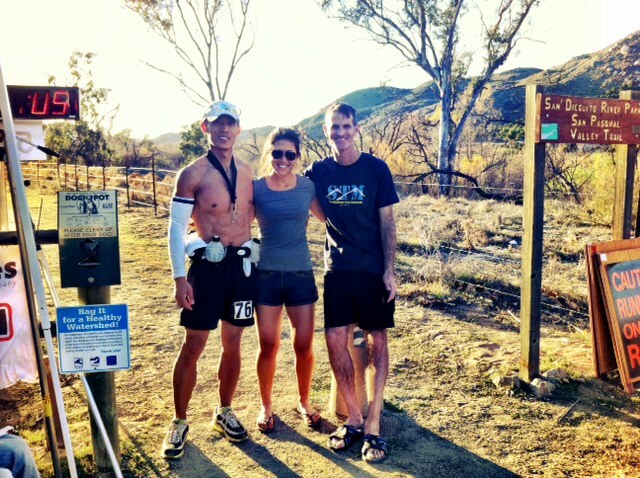 I learned from AR50 that skipping aid stations later on in the race will just catch up to me in the end. I end up losing more time because of how bad I feel than if I just stopped for a couple minutes to re-group before tackling the next section. 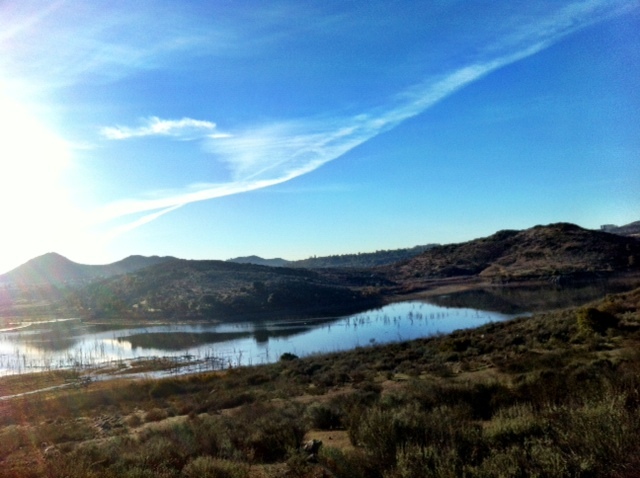 Miles 29-35 were back on the single track trail overlooking Lake Hodges. The extra liquids were helping a lot and I could feel my energy coming back around. The miles were definitely not as fast as the first time we came through, but I was starting to feel good again. I looked back and could see Keira coming up behind me, which I always knew she would catch me at some point in the race. I was happy to see her go looking really strong at Mile 34. I got to the aid at Mile 35 just as she was leaving and waited a bit hoping to see Matt come through. I hit mile 40 aid station in 6:25 and did a quick calculation that if I tried really REALLY hard, I could run the last 10 miles in 1 hour and 35 minutes and come in sub 8 hour. I didn’t even think I could run faster than a 8:30 today let alone chase a sub 8 finish. I got ice cold water poured on my head which felt really good while getting briefed by the volunteers how hot and exposed these next 4 miles would be until the next aid. Unfortunately these 4 miles were like a death march for me and I said goodbye to a sub 8. Even though the trail was runnable, it was also so exposed with no breeze or shade. I played mind games with myself to run to the next tree before I could walk a little or start sprinting until I couldn’t feel my legs anymore, which didn’t last for more than a couple seconds. I knew this was another low point in the race and every time I could feel myself thinking “I wish I were _____ instead”, I quickly shut down the thought. I repeated to myself over and over again how happy I was to be out here doing what I love to do and that there is NO WHERE I WOULD RATHER BE THAN RIGHT HERE! I chanted it and screamed it in my head until all those negative thoughts were subdued and it was really ingrained in my mind. This forced me to be present in the moment and focus on where I was right then. 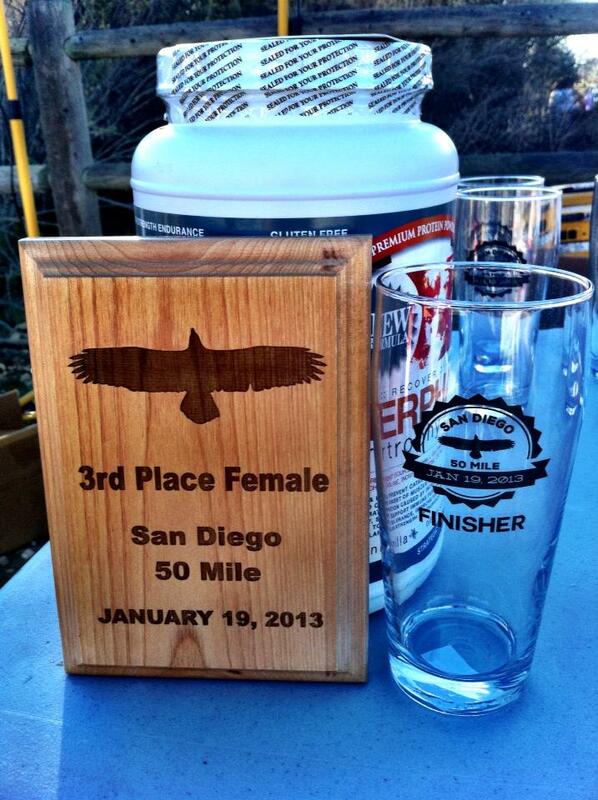 Sure, I wish I was at Mile 49.50. I also wished I were sitting down because my legs felt like they were about to fall off, but all this wishful thinking doesn’t help when reality sets in and I am in the exact same place. Positive thinking and having a good attitude even when you are feeling really crummy is the only way to get through these ultras. Fake it until you make it. What seemed like eternity, I finally reached the last aid station at Mile 44. The volunteers urged me to keep going for 3rd female and with 6 miles to go, I just started counting down the miles. We climbed back up Raptor Ridge which I actually welcomed because it gave me a chance to power hike and it was mostly shaded. We got a bit of a headwind the last few miles, but I was just grateful for the shade on the trail even though it was still hot out. With 1.5 miles to go, I watched my clock hit the 8 hour mark. It didn’t even matter at that point, I just wanted to finish strong and keep running until the very end. 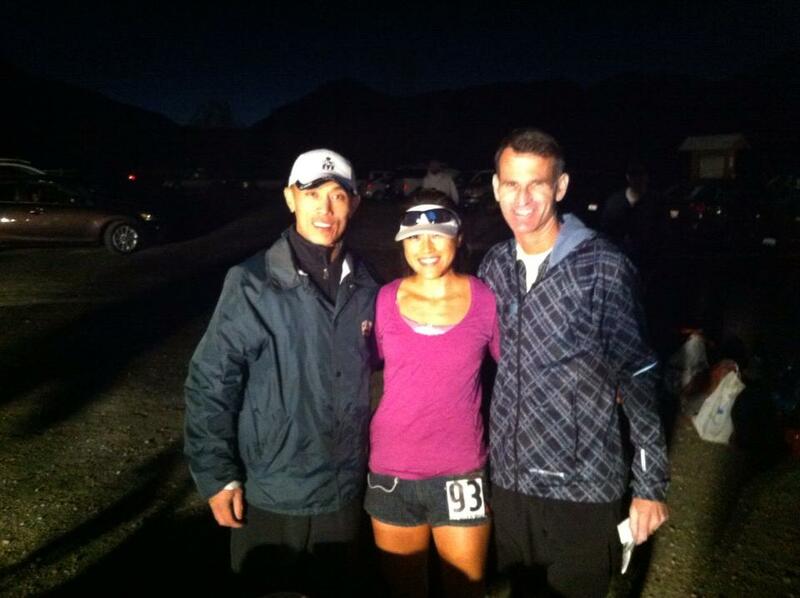 I crossed the finish line in 8:12:35, 3rd female and 7th overall. So happy with a new PR and how the day panned out even with all the ups and downs. I wished I could’ve run a stronger last half, but I did the best I could to keep going. I waited for Matt and Neil to finish, who both ran amazing times as well. It felt really nice to see the hard work pay off in the end and learning how to manage the lows in these ultras. Fantastic race Andee – great job…very speedy!